I wouldn’t lean so heavily on the puns if I wasn’t writing most of these posts right before bed, when I’m riding the line between “flush with hobbytime fun” and “beginning the process of shutting down higher functions to sleep.” I’m usually most stressed right before I go to bed, because as great as bed is, it’s a high-stakes game! You need to lie down and lose consciousness with sufficient swiftness that you don’t become awake again, sleep too late, or disturb any bed partners one may have. That’s a lot of pressure. Lot of tightly-packed real estate on the front of this guy, but with the right colors I think that the scarabs can really pop. My Daemon Prince Twins, still in mid-cure stage. 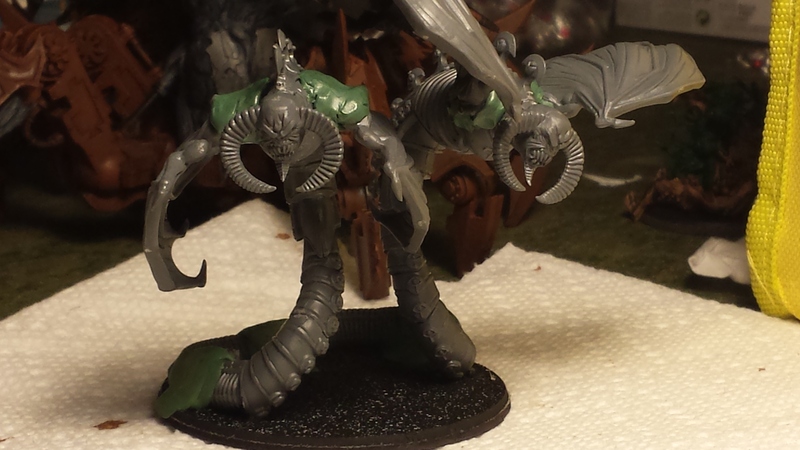 So, basically, I’ve built two Daemon Princes from the kit and not yet actually used the kit; I have more than enough pieces left for a bog-standard Prince and am still going to come out the other side glutted with arms and wings. Exciting stuff! I’d planned to build my Prince from this kit to be the CSM HQ, particularly so I’d have a Slaanesh psyker to amp up (seriously, I’m not normally one for so many puns) my Noise Marines. Now, though, I think I’ll make that my Scarab Prince. I like having the DP for the marines seem a bit more technologically-inclined, an expression of grim, forward-facing industry and the insatiable march of progress. He didn’t come out the way I’d intended, for a couple of reasons: first, I thought he’d be more of a torso coming out of a floating Tomb Spyder body; then, when I decided I liked the sort of Liberace Cape look that I could get with the Spyder bits being behind his backs (and I should note, here, that I’ve never seen a Liberace performance and couldn’t necessarily point out the man in a lineup, but apparently osmosed enough from him that I accurately described the effect as a Liberace Cape, then Googled “Liberace Cape” to make sure I wasn’t off-base, and I was firmly abase) I ended up clipping and prepping the thinner, cage-like under base only to absentmindedly clip and attach the other base. I was holding the bits together and looked down to see the part I’d meant to use still sitting on the table, but I think the new result works. 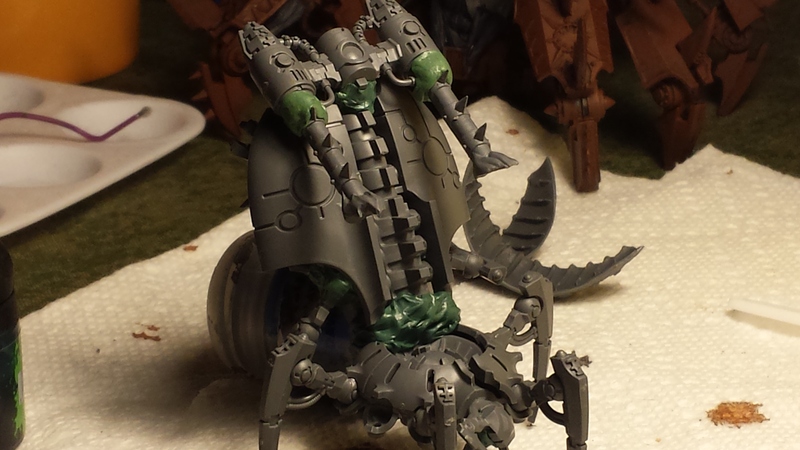 He’s incredibly top-heavy and I’ll probably need to use some basing elements to compensate for the small surface area his limbs provide, unless I just glue him onto a jetbike stand that I secure on the base. If I can get a good flame effect going on the jets on his back (pic below) I’ll be quite happy! I particularly like how short his appendages are, because it gives him a singularly bloody-minded mein; this is a daemon who needs to close with his targets to chop them up, but the mass of flailing limbs he brings to the task are brutally effective. Some clipping and greenstuffing let me turn the smokestacks from the soul grinder kit into some flame-ready rockets. My other DP(s) come out of my wanting to use the Necropolis Knights kit I’ve had kicking around for a while in a daemon conversion. I have the battalion for Tomb Kings and will probably assemble it at some point, but I wanted a serpentine DP, originally, to go with how I’d like to eventually build some Fiends of Slaanesh. 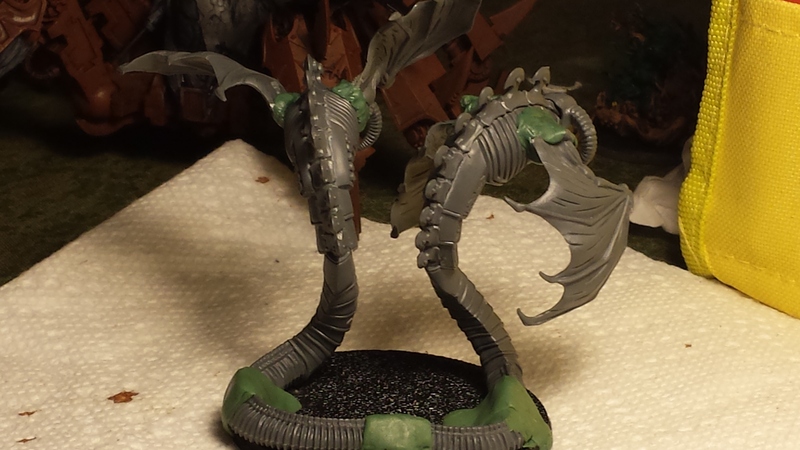 However, the pictures I’ve looked at for that seem to employ a tyranid base (Trygon/Mawloc) because the Necro Knight snake bodies are too long to comfortably fit on the 60mm base. I was playing around with the parts after I cut them from the sprues, experimenting, when I hit on the idea to go with a dual-headed DP. Slapping a head on the end of the snake worked with how the models were originally sculpted, and as a kid I had a coloring book with the Amphisbaena in it. Well, a version; I don’t recall it having limbs or wings, it was just a two-headed snake, but the image has stuck with me since preschool. As I assembled the pieces I was trying to decide at which point I’d punch out of the box-based pattern and go to greenstuffing a body/tail. The twins have an Amphisbaena thing going on, thanks to green stuff. I’ll base the model with sand to give the impression that they’re slithering through the dunes. For a while I was toying with a single coiled body that split into two heads at the neck, like those few two-headed snakes born in nature display. However, I also had all of the winged backpacks from the CSM Possessed, because giving a non-flying model wings when it’s not at least Jump Infantry seems strange to me. I found I really enjoy the image of two sinuous bodies twining around each other as their wings beat rapidly to raise them up into the air, and there’s something very Chaos about the single linked tail slithering along behind them. 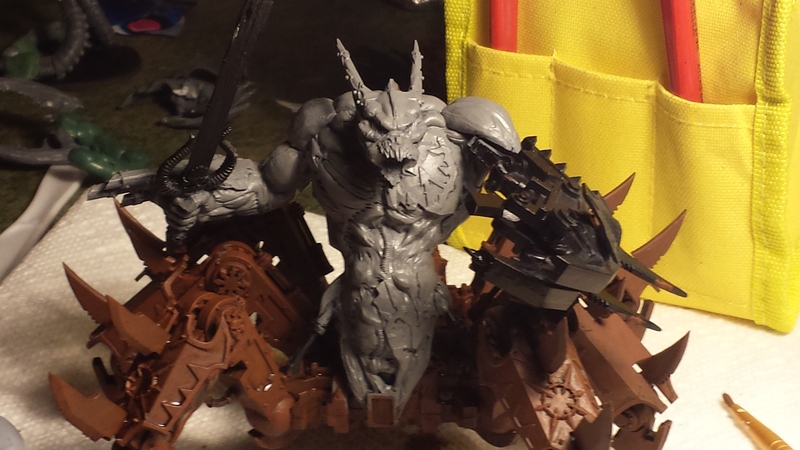 I also considered using a pair of different heads, but I’d already used the CSM DP head for the Scarab and my other DP has the tall-horned head. Going with full-on twins seemed more appropriate, and they’re still distinguished by the decorations on their respective Necro Knight bodies (one’s skulls, the other’s eyes). 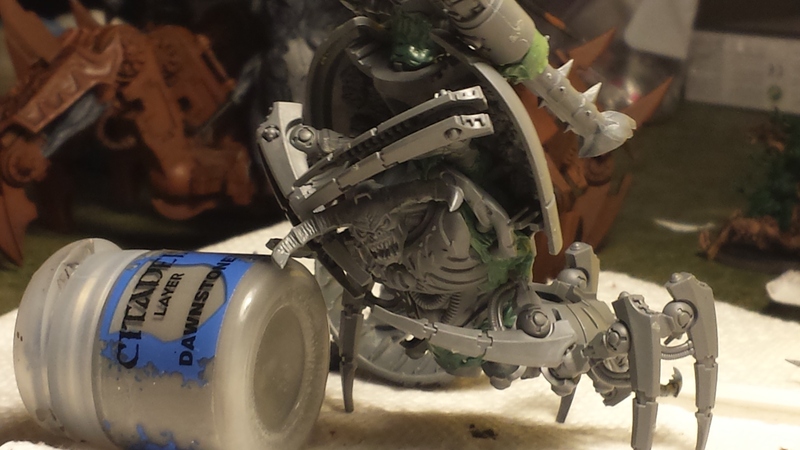 Finally, and in an actual display of painting, I’ve started working of Ephialtes the Soul Grinder. He’s the fellow my primer ran out on, and while I could have gone back by hand I decided to just start working with what I had. I basecoated his lower body in Mournfang Brown and washed it in the sepia, then did his flesh (except for the flesh on his claw, which I’m tackling last) in Dawnstone, then washed it (not shown in the picture above) in Drakenhof Nightshade. I very much like the blue he’s currently rocking, and think my next coat will be a lighter blue atop it. I want his upper body to be considerably more colorful than his metallic lower body, and am still unsure where the claw will fit into things. Other than touching up missing paint on the legs I think I’ll move right into the Corrosion/Rust combo and see just how muddied up I can make him, then go back over the pistons with an actual metallic and give the exposed rods a good glossed-up black, to create the impression that the hydraulics are very poorly sealed and maintained. It’s an effect I’ve been trying to describe to my wife as a suggestion for her Killa Kans, so it’ll be good to try and actually execute on it and see just how doable it actually is. At this point in my collection, I could fly a circus. Not that circus, since I don’t have Fateweaver (though I suppose my Twins could stand in…) and don’t much go in for the Lords of Change as a greater daemon choice. I’ve also yet to take a single Exalted reward in a game, let alone the Grimoire; I’ve mostly prioritized getting two Lashes of Despair (DP and KoS) and a survivability bump on each, and then focused on spreading as much ap2 as possible throughout my command characters and Heralds.